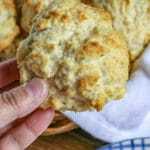 This recipe for Easy Drop Biscuits is a long time family favorite. While this is a from scratch recipe it’s easy to put together and there’s no need for rolling and cutting. Just mix the dough, drop it on the sheet pan and bake! Making biscuits from scratch can be intimidating because it can take a couple tries to master getting the dough just right. Drop biscuits are great because the dough is really easy to make and there’s no need to roll out the dough. Instead you just scoop a little of dough in a spoon and drop it on the baking sheet. 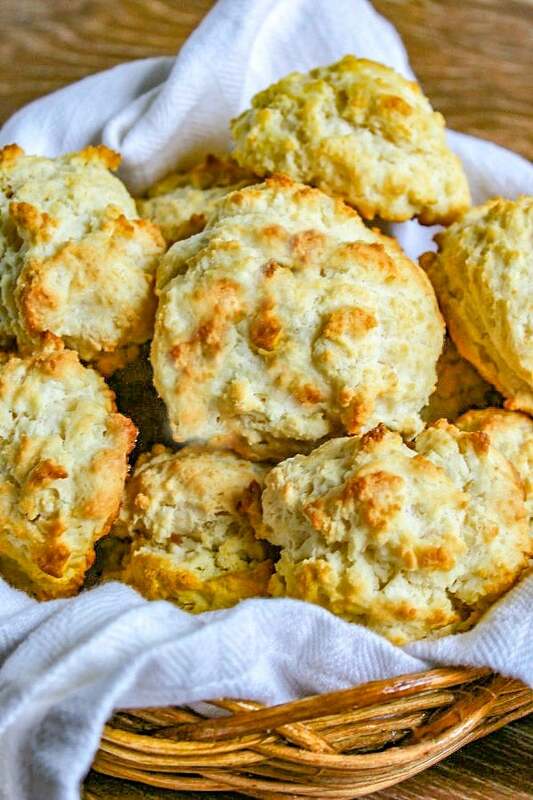 This recipe for Easy Drop Biscuits is the Cliff’s Notes version of biscuit making. I could go on and on about how biscuits are a quintessential Southern food. In fact they are as much a part of the culture as sweet tea and college football. 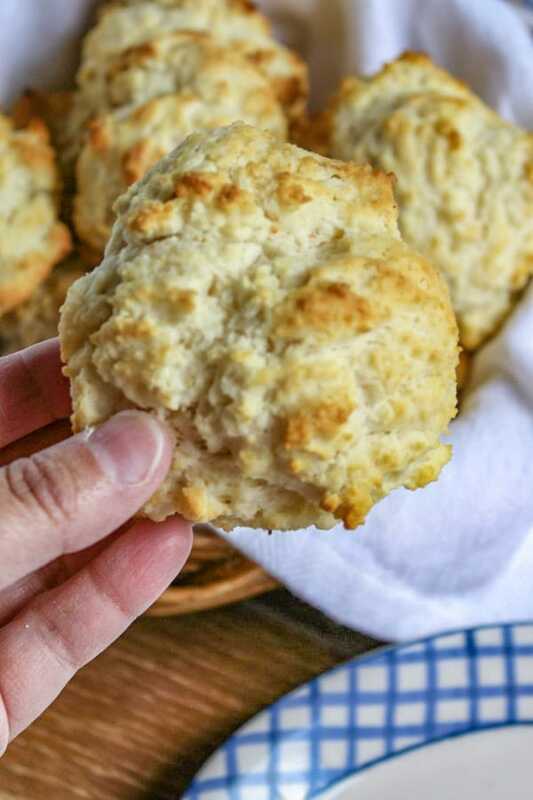 Biscuits are so important to Southern culture that there has even been a documentary, The Rise of the Southern Biscuit, filmed about how biscuits have played a role in American Southern history. 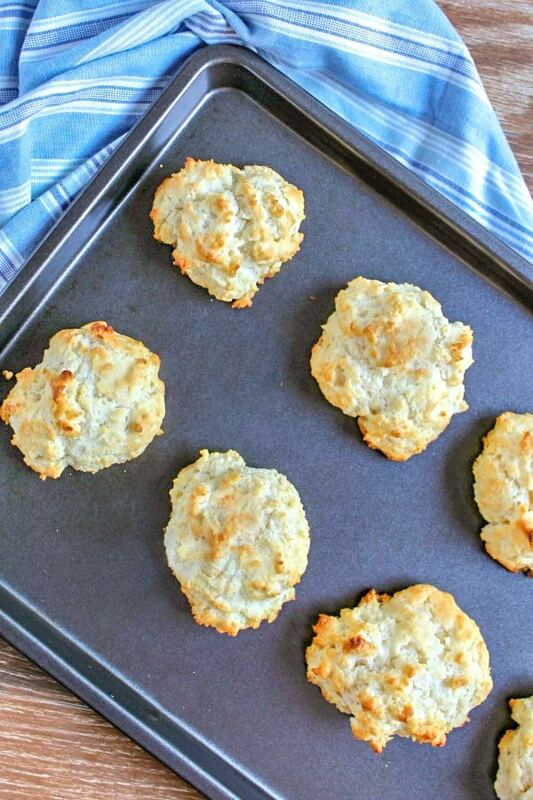 To make these Easy Drop Biscuits place the flour, baking powder, sugar and salt in a bowl and then whisk together. Then add cold butter cut into small pieces into flour and it cut it in to form the dough. What does it mean to cut in butter? When a recipe says you have to cut the butter into dry ingredients it means quickly breaking cold butter into small pieces so that the butter does not melt. How do you cut butter into flour? Use two knives pulling in opposite directions until the butter is cut into small pieces and the dough becomes crumbly. Using a pastry blender to mash and divide the butter into small pieces and the dough resembles pea sized crumbs. Once you’ve cut the butter into the dough add the milk and stir with a fork until the dough leaves the sides of the bowl. Next, using a medium cookie scoop or regular spoon scoop up the dough and drop it on a cookie sheet. The scoops don’t have to be perfectly round any shape will do. Just don’t make the biscuits more than three tablespoons in size. Next place the biscuits in a 450º oven and bake for fifteen minutes or until they are golden brown. 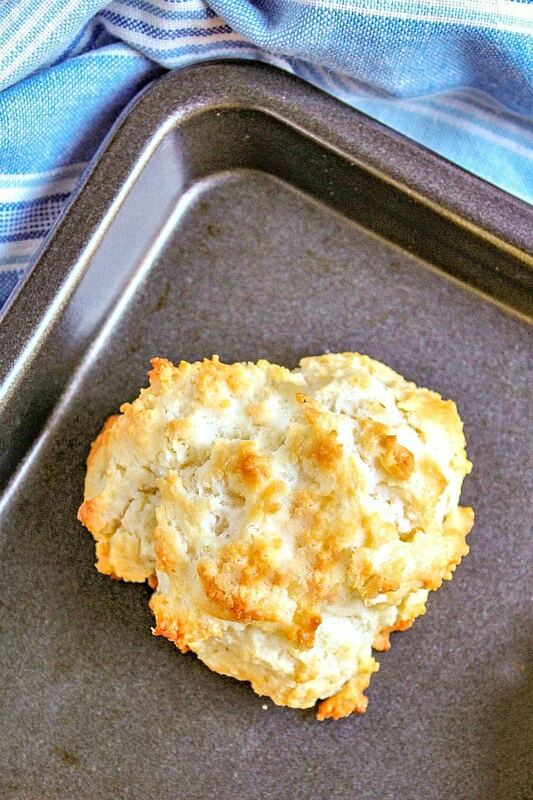 This recipe for Easy Drop Biscuits is a long time family favorite. While this is a from scratch recipe it's easy to put together and there's no need for rolling and cutting. Just mix the dough, drop it on the sheet pan and bake! In a large bowl whisk flour, baking powder, sugar and salt. Add cold, cubed butter to bowl and cut in the butter until the dough forms into pea size crumbles. Pour in the milk and stir with a fork until the dough leaves the sides of the bowl. Use a medium cookie scoop or regular spoon scoop up the dough and drop it on a cookie sheet. The scoops don’t have to be round any shape will do. Keep the scoops less then three tablespoons in size.